So scratch everything I said about re-trying Mercedes Lackey’s high fantasy novel, By the Sword, for the sake of getting out of this dilly-dally summer reading slump. That didn't work out. I got about 20 pages into that book and was still impossibly disinterested seventeen years later. Part of that disinterest comes–in fact–from my recent mention of balancing exposition in fantasy novels. Nonetheless, sure, I’ll try By the Sword again some time in the future. Until then, I decided to try the short story method of getting myself back into the groove of reading regularly and with a pace. 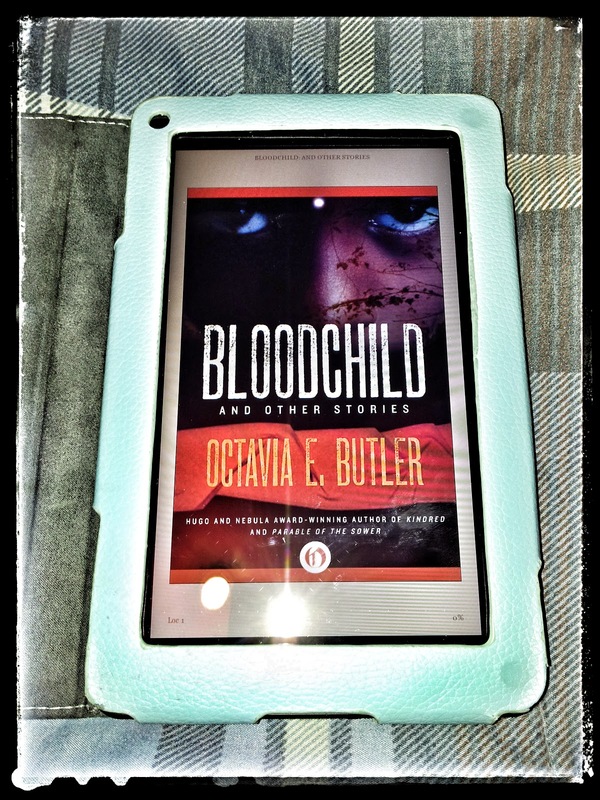 And seeing that I can only seem to read short stories via the Kindle, I dug through the available books and found my digital copy of Octavia Butler’s short-story collection, Bloodchild. I suppose saving it for a rainy day worked; I quickly hammered through this award-winning collection of stories with easy and deep, familiar curiosity. It’s been a minute since I visited one of Octavia Butler’s worlds. The last book I read by her was the final book in her Patternist series (which I highly, highly recommend). Nevertheless, I never forgot how many of her conceptualizations made me feel claustrophobic, terror and uncertainty. She writes sci-fi–or speculative fiction–after all. So all of those feelings her writing gives me probably isn't that much of a surprise, considering her genre of choice. Still, altogether she is different. And maybe her advantage is that she’s a woman of color who features the same leads in her stories. Leads that look, in part, like myself. I also love how Butler often rearranges or reconstructs the sort of energy and presence of mankind in her post-apocalyptic stories. Usually her stories are of mankind damn near pushed to extinction. Subsequently, mankind has to evolve and rely on taxing alien beings to keep themselves extant. And there is always, always a price. To me her writing is a blend of terrorizing and complicated choices that reflects American society (or the future thereof) to some degree. While the majority of Bloodchild consists of short stories, each of those stories comes with an insightful afterword by Butler herself. In the afterwords she explains what she meant to achieve in each respective story as well as the thought behind their conception. A little over halfway through the book, we also get two essays written by Butler. 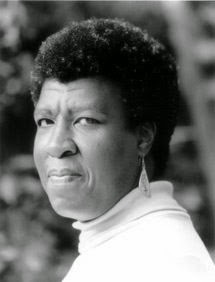 Following that are two novella length stories published within the last decade and before her death in 2006. Combined, all of this material was previously published in various magazines and literary publications throughout her 30+ year career. And if that wasn't enough, as recently as June of 2014, two of her early short stories were published in another collection titled, Unexpected Stories. So what are the stories featured in Bloodchild? I'd better tell you a little about them and hope that you'll pick the collection up also. The title story, “Bloodchild” is about how mankind is taken from Earth and onto another planet where an alien species–that resemble large centipedes as far as I can tell–develop relationships with human men before using them to nurture their offspring (eggs in this case). While that may sound not so disturbing, the truth is that this nurturing process comes in the form of impregnating human men. And with that said... I thought this was the perfect story to glide back into Butler’s work with *cue chuckle*. After over a year and half of having not read her, I immediately got that familiar claustrophobic feel back! “Bloodchild” brought me back to the entanglements present in Butler’s first book in her Xenogenesis series, Dawn. The only difference (besides length) is that "Bloodchild" seems slightly more distressing. Not because this is Butler's sort of “pregnant man” speculative fiction story, but because of the imagery used to tell it. Maybe it's because I have a problem with bugs and parasites. I think that may be the better explanation. Either way it was an outstanding read. “The Evening, The Morning and The Night” tells the story of a nameless young woman who reminds me a lot of Lauren Olamina from Butler’s Parable of the Sower. I say this because they both seem to be philosophical in their thinking; filled with thought-provoking questions, and deeply interested in mankind's available resources. Well, maybe Lauren had all those things going much more than said nameless young woman. So maybe their similarities are within their narrative tone. In any regard, the nameless woman is born with a fictional disease called Duryea-Gode. The symptoms of this disease cause sufferers to go insane, enough so that they attempt to claw their way out of their own flesh. Those afflicted are treated through a number of humane and inhumane experimental treatments. These treatments has taken place throughout decades as scientists research for a cure. And while that research is being conducted, those afflicted are seen as threats to society because of the late, and threatening, symptoms of the disease. Therefore, society turns their backs on them in fear. However, there’s an institution (or facility) where the unnamed narrator visits with her boyfriend. His mother is afflicted with Duryea-Gode, and she's in the "insane" stages of the disease. The facility the two visits kind of made me think of Waverly Hills Sanitarium, a place where tuberculosis sufferers were isolated during the early 20th century. Nevertheless, it turns out that the director of the facility manages the maniacal behavior of her patients through a pheromone she was born with. This pheromone calms or pacifies the patients. During the visit, our unnamed narrator discovers she also secretes this pheromone. Now what will she choose to do with that knowledge of herself? The next short story, “Near of Kin” isn't speculative or sci-fi. However, it is thought-provoking as a modern story that follows a conversation between a young woman and her uncle. The two come together to sort through the young woman’s mother’s estate. The young woman's relationship with her mother was not good, as her mother was mostly withdrawn from her daughter. As the two sort through the dead woman’s estate, they also sort through to the bottom of her estrangement from the family. You may or may not see the truth before it’s announced. Me, I managed to catch what took place a good few pages before it was proclaimed between the two. I'll leave it at that. I ended this story feeling just as uncertain as the characters within it. “Near of Kin” left with that “where do we go from here?” kind of atmosphere. “Speech Sounds” is probably one of my favorites. Once more, Butler uses disease to paint the complexity behind her story. This disease isn’t named, but what it does is take away speech and language as the basic means of communication. The protagonist of “Speech Sounds” is a woman named Valerie Rye. While a large percentage of the world is afflicted with the speech-less disease, Rye hides how she still retains her ability to speak. To share this truth puts her in danger with the world. During a routine bus ride, Rye witnesses a mute argument taking place between two men. Before it gets explosive, she jumps off the bus. This is where she meets a man who was once an LAPD police officer. Through a tumbling ASL exchange, Rye discovers his name is Obsidian. In this near dystopian world, Obsidian hasn't given up on law and order. He uses tear gas to halt the bus fight. Afterwards, Rye and Obsidian slowly attach themselves to one another. Unable to speak, they ride around the city in Obsidian’s truck until they find themselves in another deadly conflict involving children. Silently, the two proceed to put a stop to this crime. One doesn’t make it out alive. It took me a moment to realize that “Speech Sounds” is absent of dialogue. It wasn't until much later when the speech-killing disease was revealed that I noticed. And like that one episode of Buffy called Hush, Butler pulled the lack of dialogue out cleverly. And like always, while the story is always wonderful, it once again shows the sort of lack of trust Butler has in the relationships between people. Meaning how there always has to be something incomplete, threatening, or just on the cusp of misanthropic. The last story before we move into Butler’s essay portion is a story called "Crossover." And you know what? This was my favorite of all the stories. It isn't sci-fi, but it hit home with me like none of the others. “Crossover” is about a woman working a factory job. There’s no future here. No way out. Just a lump sum of absolutely nothing to look forward to. And not only is she crippled physically, but also mentally. She has a complex, formed by low self-esteem and other mental propaganda. She even suffers from hallucinations. Her trips to the liquor store doesn't help her headaches. But she keeps going. This all clicked with me. I understood her story. However, I can see why some may see "Crossover" as their least favorite in this collection; I have to repeat that it’s my favorite. I got how this unnamed woman, who works this horrible job, walks around with a headache, drinks liquor, and hallucinates about ghost, is not the woman Butler wanted to become in the early stages of her writing career. And latterly, how writing saved her. I got it. I understood it. I’ve lived some of it. And in my heart, I, too, am still living a life where I am afraid of becoming such a character. When I tell people that keeping a blog and having the ability to write and share my thoughts are saving me, they usually chuckle. Not a lot of people get it. But I was glad to see that one of my favorite writers did. The last two stores in Bloodchild will continue into the next post where I also talk a little about the two stories in the Unexpected Stories collection.